Fresh Coriander – 2 tbsp. Dry Coriander – 1 tsp. 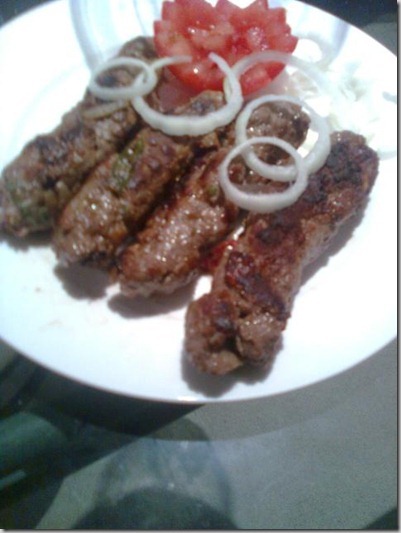 Kabab Chini – 1 tbsp. Poppy Seed – 1 tbsp. Take all dry ingredients and roast it, then blend it. Take mince in a bowl and add grinded spices, fresh coriander, fine chopped bell pepper, carrot, spring onion, green chili and process it in a chopper. Add salt in it mix it and make seekh kebab shape. Take a pan add 3 tbsp. oil and fry kebab on normal flame. If you want to bake kebab, so bake it at 200c for 20 minutes. You can also make them or grill and you can also barbeque them.